After posting a dominant victory over Brian Stann at UFC 136 on Saturday, Chael Sonnen (Pictured) proceeded to unleash one of the most unforgettable speeches in the history of ever. For those that thought his loser-leaves-town challenge to middleweight king Anderson Silva was priceless, you should have stuck around to hear what the controversial wrestler had to say at the post-fight press conference. “It was spur of the moment,” Sonnen said of his in-Octagon spiel. “I saw [Silva] sitting in the crowd and we’ve got unfinished business. They’re talking about someone else coming in there [and fighting Silva next]. This is me and him. And frankly, it’s me, then him. Of course Sonnen is referring to his UFC 117 title loss to Silva in August 2010. After manhandling Silva for nearly five complete rounds, Sonnen was abruptly submitted by “The Spider” with only 110 ticks remaining on the clock. Although Silva’s Hail Mary was answered, Sonnen never got the memo that the crown wasn’t his. Former Strikeforce light heavyweight champ Dan Henderson faces Mauricio “Shogun” Rua next month at UFC 139. There was chatter UFC president Dana White was considering pitting him against Silva next should he beat Shogun. According to Hendo, a rematch with Silva was what the UFC initially wanted for his first fight back in the big leagues, but Silva’s injured shoulder promptly nixed those plans. Silva owns a 31-4 professional resume and holds the UFC record for most successful title defenses with nine. He submitted Henderson at UFC 82 in March of 2008. 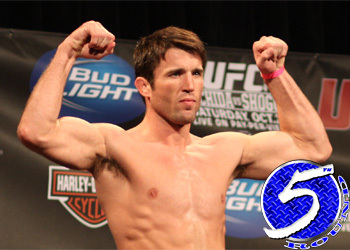 The baddest 185-pounder in bare feet appeared unfazed when Sonnen issued his outrageous challenge.